As the ancient mystics and sages told, and as scientists have long postulated and increasingly agreed on, our physical universe originated from the vibrational energy of sound; In the beginning was the Word. Throughout the history of civilization on our planet, many ancients, shamans, and indigenous peoples have used sound, color, and visuals for healing, accessing altered states of reality, and transpersonal consciousness. This includes chants and of course drumming, with its neurologically in-training beats that typically help manipulate the brain state of a practitioner and, in many cases, enable a trance state. In later centuries, music was organized into what we term the seven-note diatonic musical scale. Between the 10th and 13th centuries in Europe, polyphonic Gregorian chanting was the in thing, but the monks had difficulty remembering all their songs—that was until an Italian Benedictine monk named Guido d’Arezzo (c. 991–c. 1050) decided to help. He introduced the concept of solmization—attributing specific syllables to each note. Guido introduced six core frequencies, and a seventh was added later. This came to be referred to as the solfeggio scale. Of course, the concept was not isolated to Europe. As it turns out, Durr-i-Mufassal is the Arabic solmization system, possibly improved on from ancient Greece. Sargam is the ancient Indian version and so it goes on. Frequency correlation in sound and light/color. 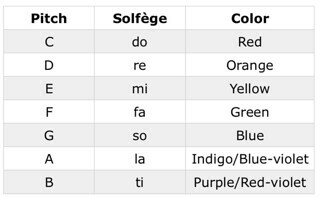 The English mathematician and physicist Sir Isaac Newton (1642–1727) associated the seven solfège syllables with the seven colors of the rainbow, and surmised that each color vibrated accordingly. Thus, red has the lowest vibration frequency while violet has the highest frequency. The jury seems to be out (to a degree) on the efficacy of solfeggio frequencies for healing—for example, there is dispute regarding the fixed-tone healing effects of a solfeggio frequency, and the parallels in relation to the time-frequency uncertainty principle of quantum physics—but via scientific knowledge of quantum coherence, and by extension “cymatics” (geometry through vibration), there is a growing body of evidence that seems to support the influence of sound on physical health—as well as emotional and spiritual health. Because sound energy has a demonstrable effect on matter. Experiments with sound vibration and resonance began to be conducted many years ago. We’ve all witnessed the diaphragm of a bass speaker “wibbling” to the beat of the music, right? And when the music is really loud, we can feel the vibrations of the music in our bodies as the sound waves penetrate our physical being. A powerful bass frequency will tremble our hearts. Sound is visceral. More than that, however, frequency creates form. The below image illustrates an experiment of sound, scaling the octaves, and its subsequent effect on matter—salt in this case. A good sprinkling of salt is poured onto a flat surface above a loudspeaker. No surprise, the salt moves as the sound is played. 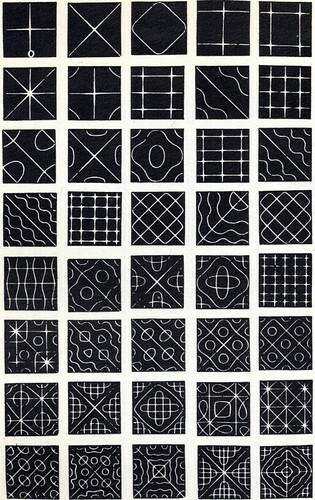 The surprise is how the salt “jumps” into complex geometric patterns at each pitch. A similar phenomenon can be observed with water. Resembling snowflakes, matter behaves according to the frequency of the sound. This is known as cymatics; geometry through vibration. And when I remember that a large percentage of our body is composed of water, as is our planet, it makes me think of holy water and its power to heal. But I also think of all that negativity radiating from people’s hearts and its poisoning effect on the natural world. But I digress . . . ! As sound frequency has a direct affect on matter, there is a compelling argument that it has a corresponding affect on our health—that the sounds with which we infuse our bodies have a profound impact. There are waves of modern musicians and sound workers who are “reclaiming” the power of sound as a healing tool from the dis-harmonious frequencies that, some say, have been upsetting our central nervous systems for many years, putting our bodies and minds into a state of dis-ease. The chants and mantras of spiritual practice go beyond the intention of their words. Firstly, as each incarnated soul in each individuated body has a particular and unique resonance, much like a finely tuned radio station in constant transmitting communication and creating what some suggest is a tone perfect for our own bespoke expression, the specific vibrations of sounds passing through our body have a profound effect. Like correct breath work and its own effect on the brain, so does the specific and correct pronunciations of the mantra’s language, which is often more phonetic than makes intellectual sense. In ancient Hebrew, focusing on the letters that spelled the word of God was known as kavanah, in the same vein is chanting the Bija Mantras of the Vedic tradition—AUM or OM being the most widely known and considered fundamental in the creation of the universe. These seed mantras (OM, KRIM, SHRIM, HRIM, HUM) and chakra mantras (LAM, VAM, RAM, YAM, HAM, AUM, AH). Seed syllables of the buddhas in Buddhism (from the DHIH of Amitabha to the TAM of Green Tara) or the five indestructible wisdom warrior sounds of Bon (A, OM, HUNG, RAM, DZA), and so on, bring about specific vibrations and resulting effects. It is also worth considering the sacred chambers left to us throughout the ancient world. We have interesting findings in the Egyptian pyramids and from ancient Greece. Many were known as “sleep temples” in which trance rituals and chanting took place to facilitate healing. Many of these were temples to Asclepios, the Greek god of medicine. The Pythagorean theorem and the study of “ten ton ana logon pragmateia,” the theory of proportionals and irrationals. * This is Pi; Phi; irrational ratios; and the work of Eudoxus (390–37 BCE) on proportions; the Golden Ratio. Ancient Grecian and Egyptian pyramid chambers (and many other lesser-known establishments around the world) have been found to have pitch-perfect resonance and are believed to have been used for healing in the belief that the frequency waves of music have a molecular-level effect, as our every DNA starts to resonate in harmony with nature’s Phi spiral.